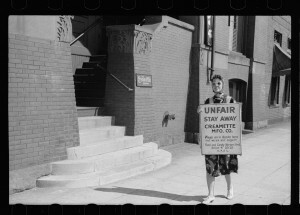 Striking Minneapolis worker, Creamette Company, September 1939. Image by John Vachon, Library of Congress. The Historyapolis Project seeks to illuminate the history of Minneapolis. Inspired by the idea that history is a powerful tool for community-building, our team is working to unearth stories that can explain how the city took shape. We hope to entertain and engage as many people as possible. But we also have a fierce desire to challenge popular assumptions about our city’s bygone days. This work began with the recognition of a community need. In our state’s largest city we do not have a clearinghouse where people can go to find the full story of the past. No complete history of the city has been written since 1940, when Minneapolis: The Story of a City was issued as a joint effort of the Works Progress Administration and the Departments of Education for the city and the state. Today, Minneapolis sees itself as a progressive metropolis. Residents boast about a superior quality of life that includes superlative arts, world-class parks, an innovative non-profit sector and a climate of social tolerance, especially for sexual diversity. While this civic pride is commendable, it can obscure dark and troubling episodes that contemporary residents would like to forget. Our team is working collaboratively to craft a courageous history of our community, creating narratives meant to encourage a reckoning with the complex legacies of our collective past.